Click here to see preview images from the show. Here's something you might not see anywhere else: a sneak peek at the three upcoming Joe Ledbetter pillowcase sets which will be arriving at Tenacious Toys in late March! Three full-color designs, packed in pairs, as pictured above. Each package comes with two standard-sized 20 x 30 inch pillowcases in a 73/27 cotton/poly blend. Cost will be around $28 per pair. If you just CAN'T wait till then, email us at tenacioustoys@gmail.com and we'll add you to an unofficial list, getting payment from you later, once the products are in transit on the way to us. Cheers to Zach of Furry Puppet for passing along this most excellent (and free) DIY Valentine's Day gift! Click thru to Furry Puppet to download the pdf and get folding! Your girl will give you big smooches on Sunday. Lunartik in a cup of Dirt!, originally uploaded by Matt JOnes aka Lunartik. Rad Lunartik Cup of Tea custom by Dust. See all the amazing Cup of Tea customs here. There are literally dozens of amazing customs to be seen! This crazy Freaky machine has been haphazardly roaming the world with no due care and attention to what ever it destroys in its wake. We as a race can only hope that the Shrooms below its gigantic feet don't die in vain, as they are slightly enchanted! One off custom piece made for the Ik'sentrik shop opening in Bath. Signed by Matt JOnes, hand painted & sculpted onto a Limited Edition Knuckles Bear no.285/500 pcs. Now the final piece stands 13" tall on a cast resin base inhabited by 8 hand made Shrooms. The base measures 9" in Diameter. The lucky buyer will also receive a special limited edition AP (Artist Proof) print to display with the piece. This piece will be for sale for 1200 pounds. See a 360-degree turnaround on Matt's page here. If that's too rich for your blood, Matt's also selling a limited run of 25 signed & numbered prints for 40 pounds each. Prints and custom can be purchased here. U1ToyArts presents a 10-inch wide graffiti wall sculpt piece by LA graffiti artist Vox One (aka VOXER). 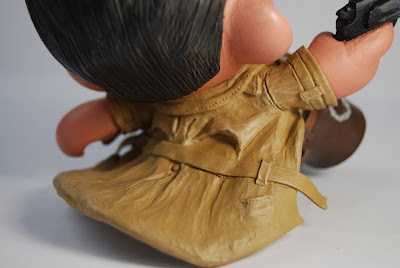 The sculpt is done by Dave Kawano, the same sculptor who did Nathan Hamill's Boris figure. This piece will be released on February 27th at Crewest (110 Winston St in downtown LA), and of course Vox One will be on hand to sign and meet fans! The piece is limited to 500 pieces and the retail price will be $85. Fan who cannot make it to LA for the release party will be able to purchase this piece from a variety of retailers/dealers with DKE accounts. We got an excellent email from Rotofugi this morning telling us their Marshall Zipper pulls are shipping to retailers EARLY! What a refreshing announcement. 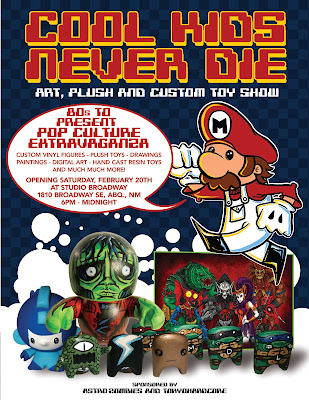 We're often told that toys will be late... they'll be in our store in about a week. Marshall zipper pulls are blind boxed and will cost $3.95 each. O.D.M. 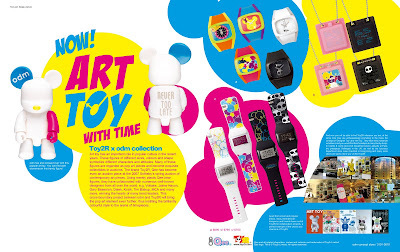 and Toy2R have joined forces to release a new collection of fashionable fun watches. 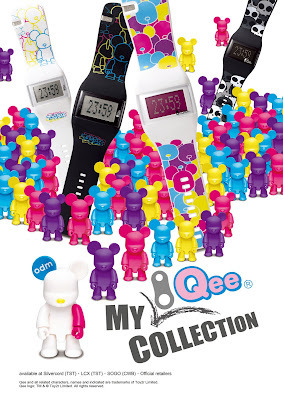 Presenting the Qee Collection featuring colorful watchbands and pendant timepieces from O.D.M., one of the world's trendiest manufacturers of fashion forward watches. While each watch sports artwork inspired by Qee, there's also the new 2.5" O.D.M. Qee available! The collection is being launched through various Hong Kong retailers like Silvercord, LCX and SOGO and will be featured throughout more than 160 fine boutiques in China, Hong Kong, Taiwan, Singapore, Indonesia, Malaysia, Thailand, Philippines, France and Italy. 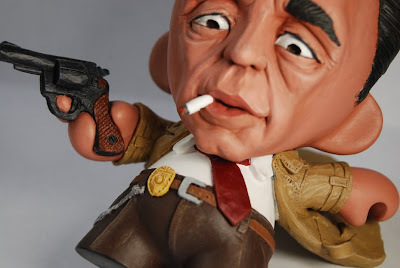 Following my two recent commissions, the vampire and the artist series suffocating piece, I was asked by the same private collector to create a custom munny with the police officer theme. To be honest, I'm not a huge fan of police officers especially after my recent experience with jury duty. But after mulling this concept over I did remember one detective that has always arrested my attention. That would be one Sam Spade. Sam Spade is the legendary character from the 1941 film classic, The Maltese Falcon, portraited by one of Hollywood's best, Humphrey Bogart. Now in the film, Bogie plays a private detective and not a police officer, but I took some liberty with the character and suggested a Sam Spade from his years prior to his private practice. 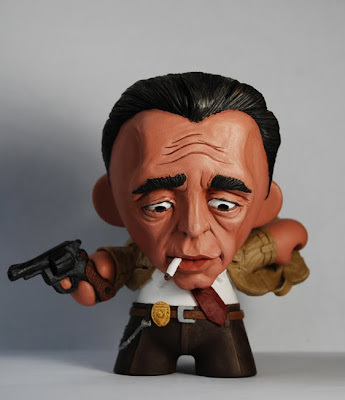 The custom was created using a 4" Mini Munny, wire, polymer clay and acrylic paint. Poster Cause Battle Series Prints coming April 15th! Are you ready? Cuz this is gonna knock your socks off: Poster Cause announces that on April 15th they will begin releasing prints in their upcoming Battle Series. 4 prints in the series, each one a collaboration piece between two big-name artists! I am so psyched for this series: Poster Cause always has AMAZING artwork at attainable prices for those of us who don't have multiple hundreds of dollars to acquire original art from these popular artists... AND the profits go to charity. 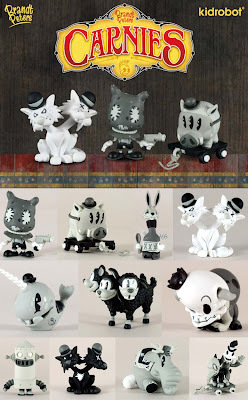 New Brandt Peters "Carnies" grayscale mini figure series coming soon from Kidrobot. Seen on Spanky Stokes, who saw this on the KRonikle. Retail price will be $9.95 each and they'll be blind-boxed. David Foox releases My Heart: The Ultimate Valentine's Day Gift... A piece of his heart. For that very special someone, artist David Foox has created a work of art that is limited to a very small number of pieces. His own heart painted using heavy duty acrylic (hand mixed from powder to liquid by the artist,) on top of an X-Ray of his chest. The number of pieces are directly related to the amount of radiation he is able to withstand in a year and are done for this year's Valentine's Day. "I hope I don't get sick and need any more X-Rays, cause according to my doctor I am not allowed any more radiation! ", says FOOX describing his Valentine's Day special series of Hearts. With his heart broken so many times, FOOX has decided that his heart would be best kept in the possession of someone else. "Since it keeps getting broken and stitched up while in my care, I thought it best to hand over to the next guard," says FOOX of the motivation to create this work of art for Valentine's Day. In addition this series addresses the immediate and pressing concerns of today's healthcare demands on society and acts as a bell weather for the changing state of US healthcare. Artists like making statements about society and here FOOX says "Don't ignore the issues of US Health Care, deal with them head on and make a difference!" He continues in his lilting Kiwi accent. "You can't give more than your heart to someone - and this is as raw as it gets"
Each piece comes framed in a backlit box and exudes a very spooky and personal quality about it. "Imagine having your very own heart painted on top of an X-Ray of your body," continues FOOX in talking about his work. This project is limited to only eight X-Ray films, each hand painted and unique. If you are interested in giving one of these to your true love, move fast, they may already be sold out. With a price tag of $3,000 per Heart, they're nothing to sneeze (or cough) at. PS: FOOX reports that as soon as he is able to withstand more radiation, he will do a 4th of July series of eight back x-rays with the spine painted. “America needs a little back bone right about now,” says FOOX. Dimensions: 20" x 17" x 3"
Domo Party lights coming in May! Dark Horse is very excited to introduce some fantastic new Domo products that are guaranteed to delight both young and old. You can brighten up any festivities with the all-new Domo Party Lights, featuring five brilliant colors of Domo! Retail price will be $14.99, although I'm not sure exactly how many lights you'll get for that. Hopefully it's a long string of twinkling Domos. Pretty crazy. 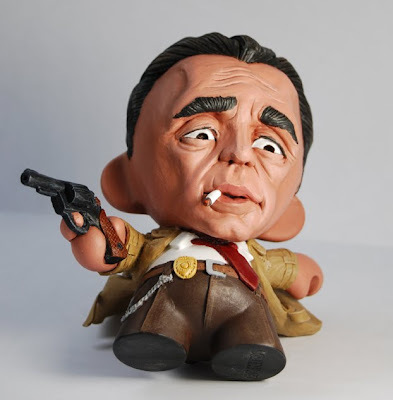 From Argentine artist Patricio Oliver: the Cursed Twins were one of the most sought-after figures in PO's recent Kidrobot mini figure series, the Cucos! Limited to 500 hand-numbered cards. 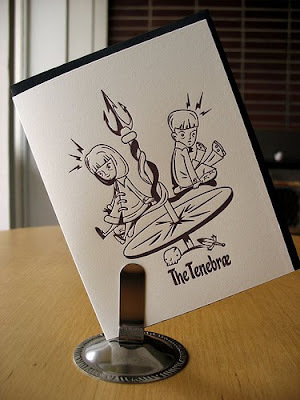 Letterpress printed in maroon on natural white 110# stock with black envelopes. Five cards & envelopes per pack. Available for pre-order here. Cards will start shipping by Feb. 12, 2010. Bryan Collins just announced that one of his t-shirt designs will be available tomorrow, Monday February 8th on the RIPT Apparel website. "Get Off My Cloud" is a limited-edition 4-color design that will be printed onto a soft ring-spun cotton t-shirt (men's or women's). RIPT sells one t-shirt design per day. It will be available for order tomorrow ONLY, make sure you go there on Monday! $10 is a fantastic deal for a limited t-shirt design.